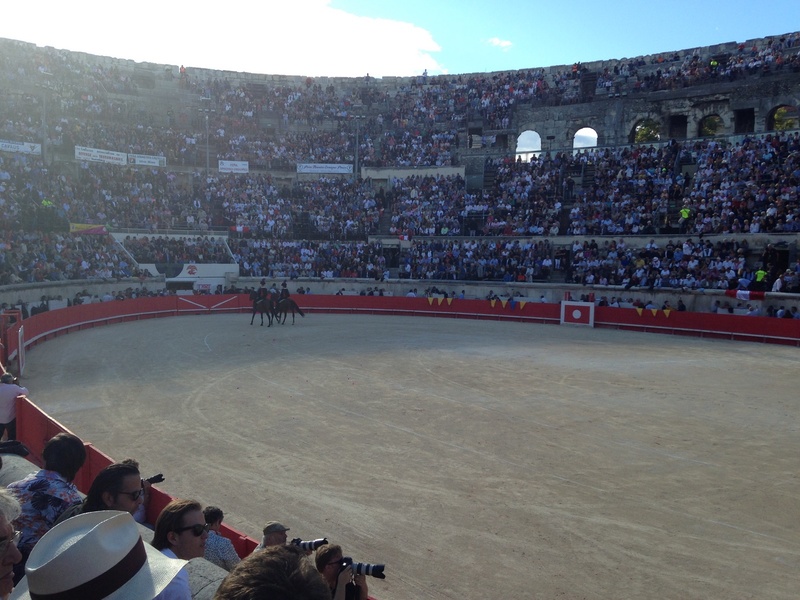 Home > What to see and do > Nîmes > Monuments > Arènes de Nîmes (The Arena of Nimes). 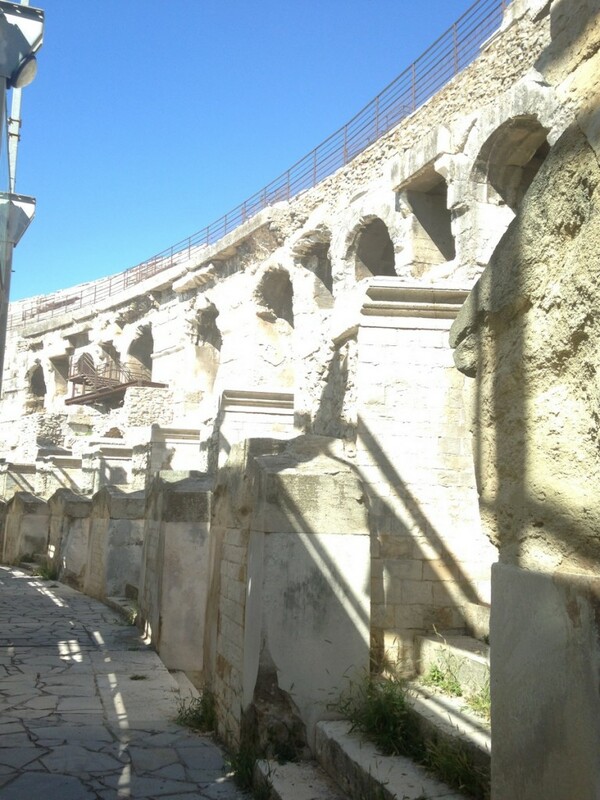 The Arena of Nimes, “Les Arènes de Nîmes” in French, can be seen as one of the best evidence of Rome’s advanced engineering. 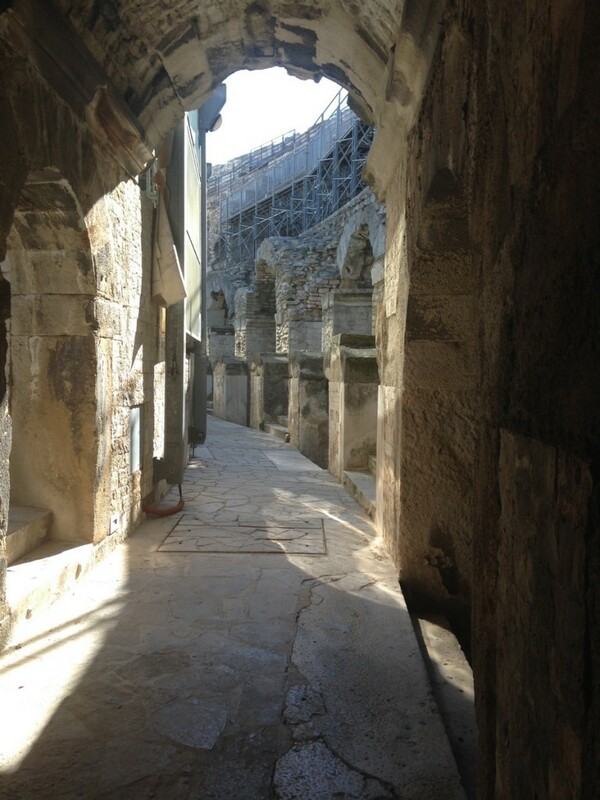 The Amphitheatre’s construction and complex architecture is a true marvel of ancient engineering perfection. 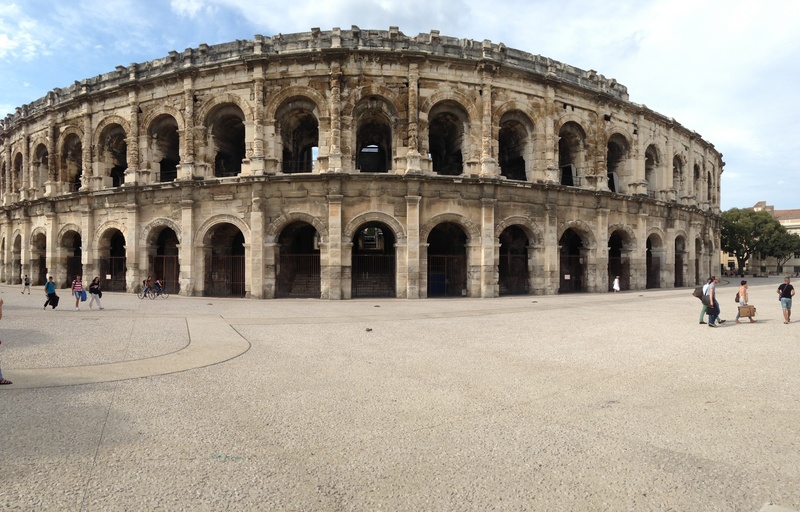 This arena is located in the French city of Nîmes, Languedoc-Rousillon region, Gard Department and was built somewhere around 70 AD. 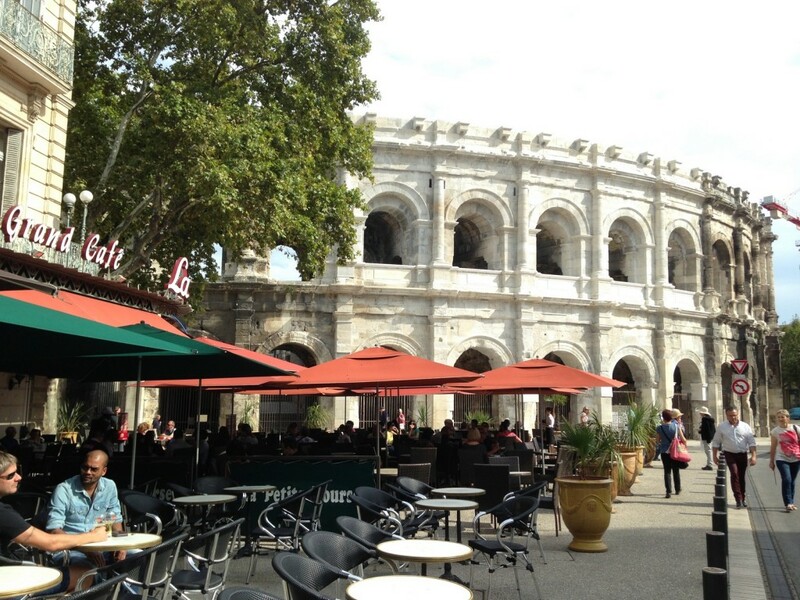 It is the pride of the inhabitants of Nîmes and a monument that any fan of Roman History must see. The monument was remodeled and restored to its magnificent state in 1863 and ever since has been used for bull fights, concerts and various other public events. The building now with a capacity of a 16,300 spectators, even has a comfortable heating system and (a roof) a movable cover, that glides over when the need be, usually in winter. Surrounded by a beautiful attic and some 60 arch over two floors, this 21 meter tall monument is the most preserved Roman arena in the world. It is roughly elliptical in shape and measure 133 m long and 101 m wide. 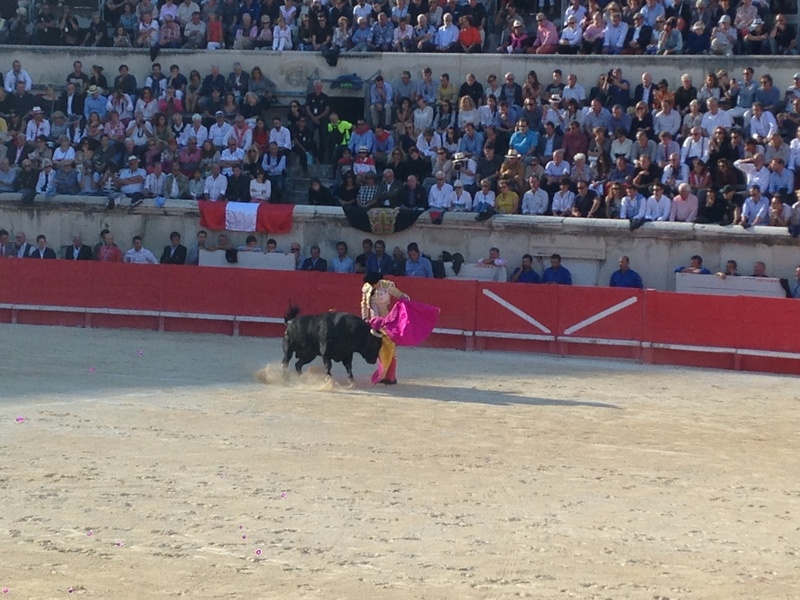 The arena where the shows took place measures 68 m by 38 m.
Several time per year the arena is holding a lot events, music concert, Roman games etc… One of the most local and acclaim event is the bullfight. 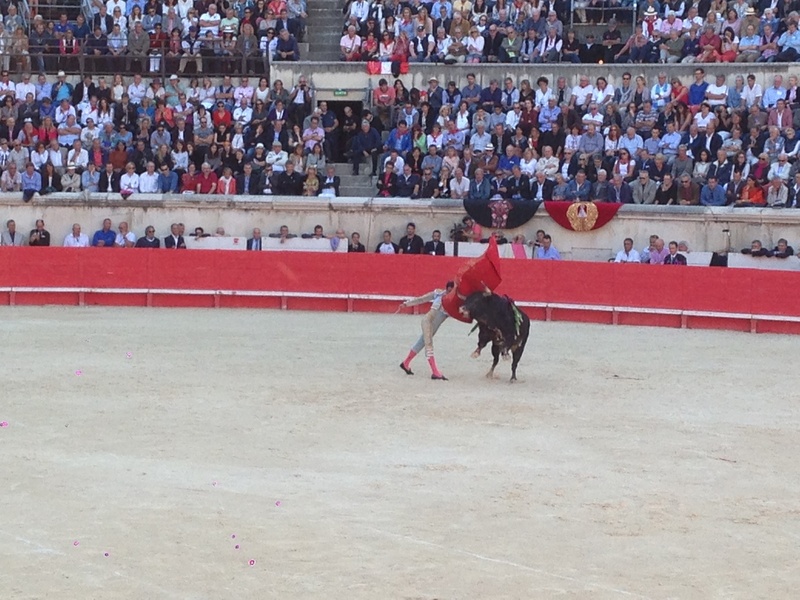 The bull fights in the Arena of Nîmes are called Corrida (from the Spanish “Corrida). 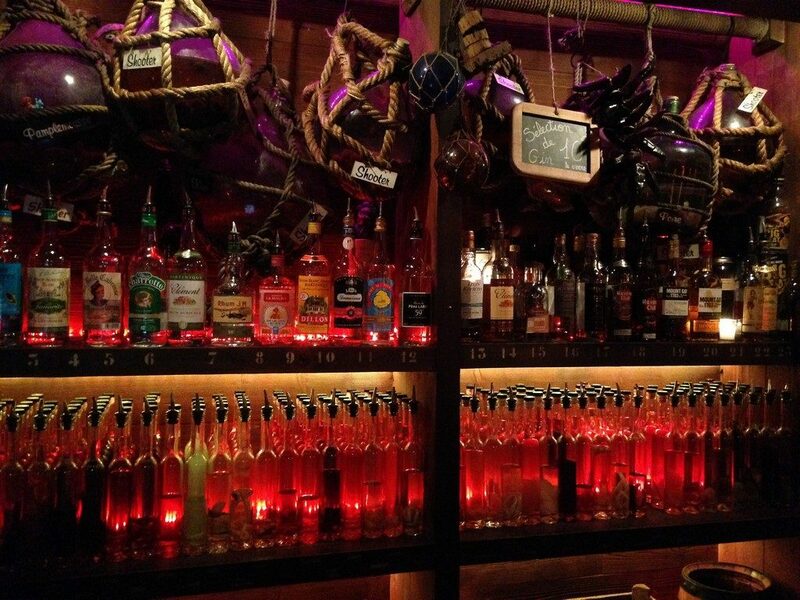 They are the evidence of how the Spanish Culture is very present in the region. 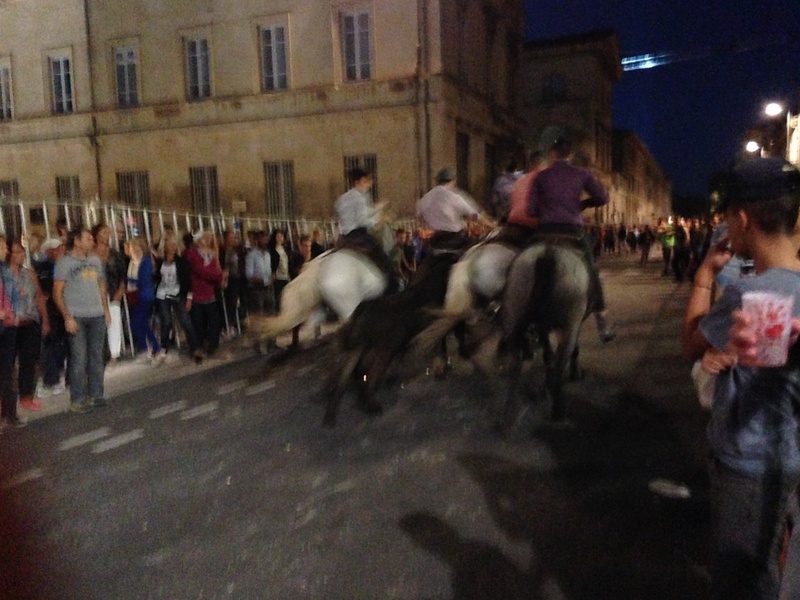 Corrida are organized several times per year in Nîmes during local festivals called “Feria” (From the Spanish “Feria). 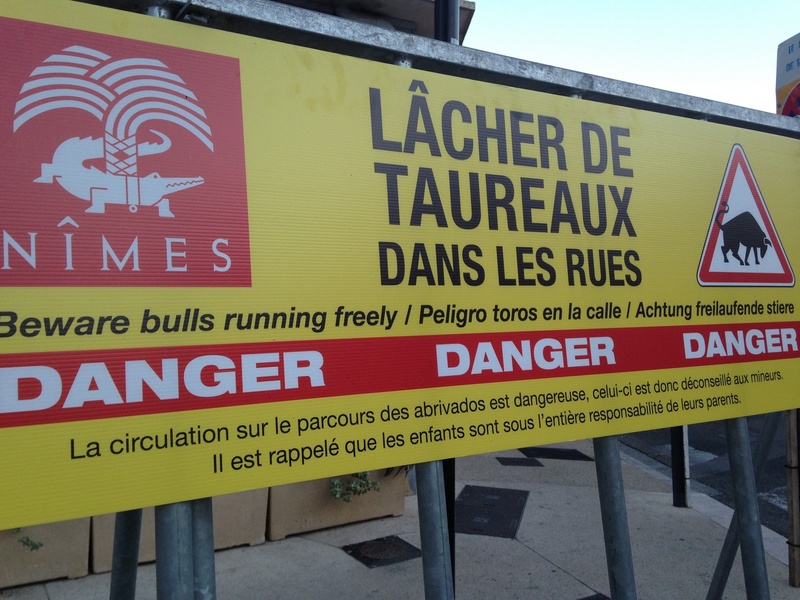 There is also some other games this time with no death of the bull, we call them “courses Camarguaises” and the bulls tha are used for these event are typical local bulls from Camargue, they are less dangerous than the bulls we use for Corridas. 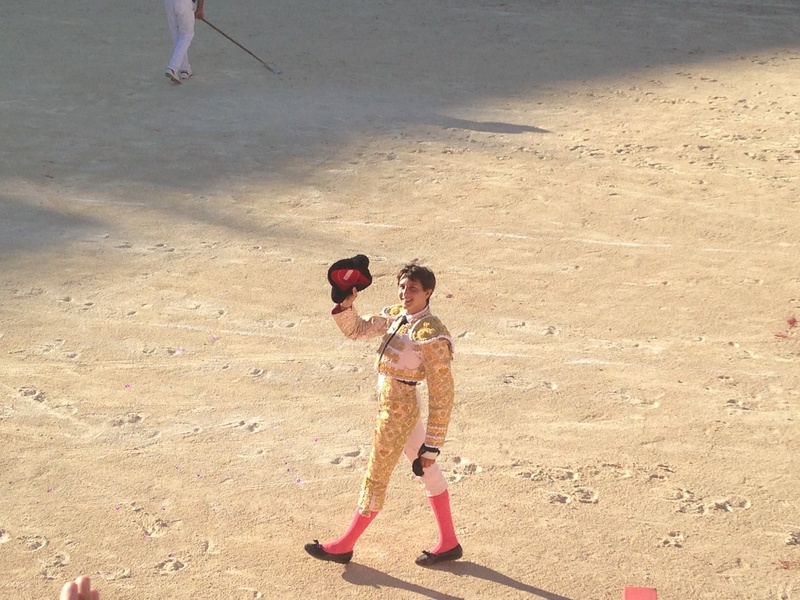 It is extremely important to notice that the bulls used for Corridas are only raised and selected for Corridas. They are selected for their brutality and those animals (at the opposite of most animals) never give up a fight, whoever the opponent is. 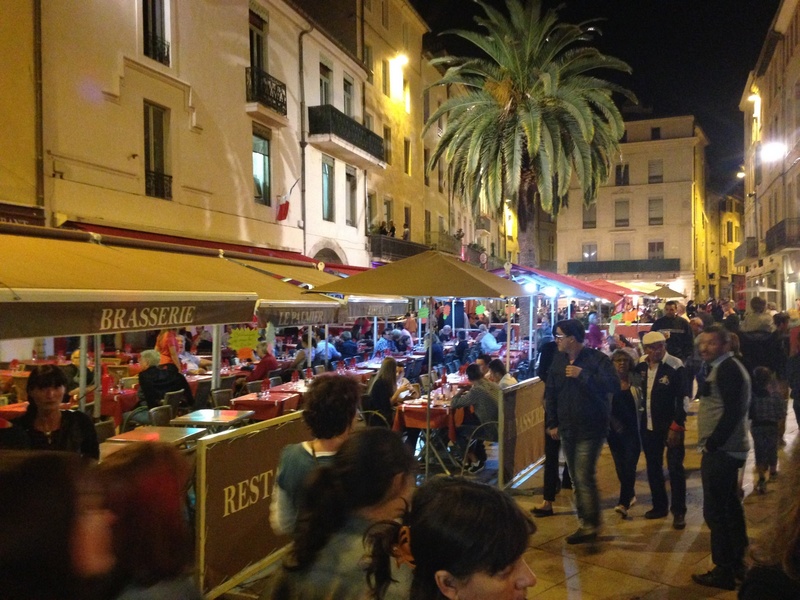 The Feria is definitely a real institution in Nîmes, this is THE event that you must literally attempt once in your life. 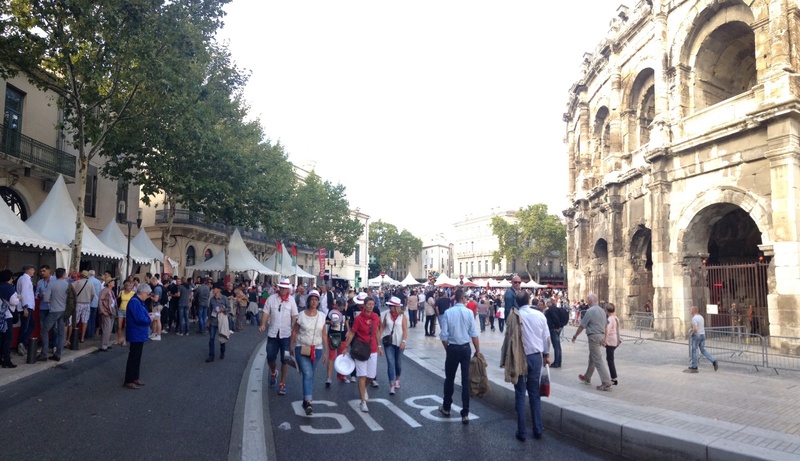 There two big Ferias twice per year in Nîmes: The first one and the biggest one by far is the “Feria de Pentecôte”, which take place for 5 days between the end of May and mid-June up to the year. 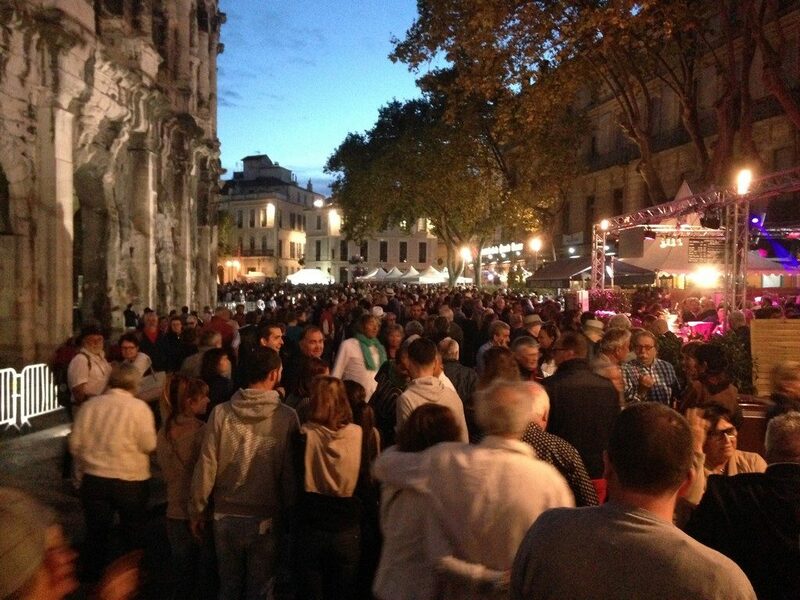 The second one is the “Feria des Vendanges” which take place for 5 days the third week of September. 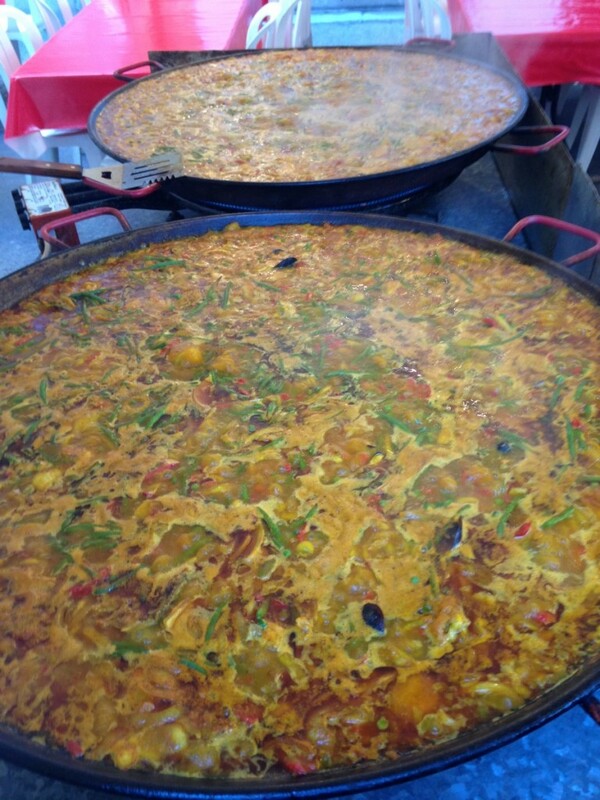 What makes the Feria such a unique and outstanding festival is the multitude of events that you can see all over the city! Pégoulade (which is a carnival/procession that launch the opening of the Feria), corridas, Bodegas (from the Spanish word “Bodega), Sevillanas dances, Spanish food and giant paellas freshly made, Sangria, Flamenco music concerts and plenty of bull related events such as the ancierros and abrivados where we literally let the bulls playing with people in the streets! 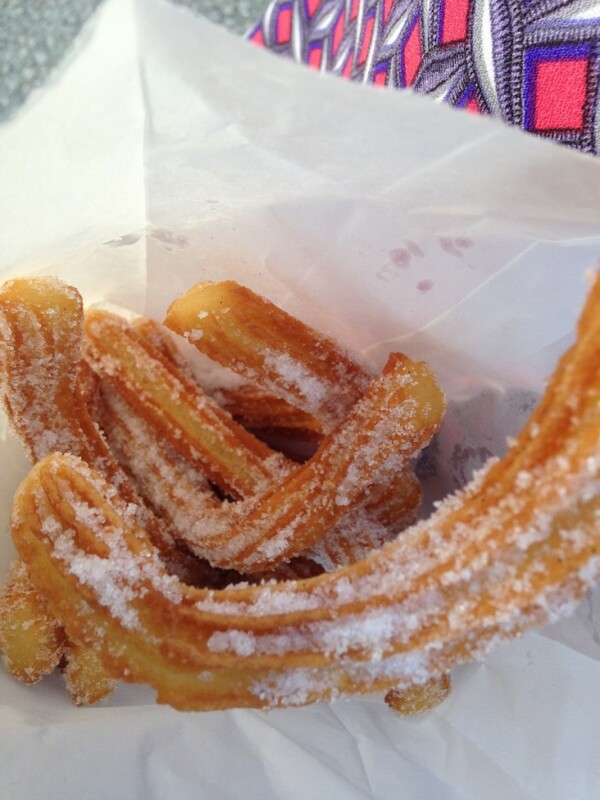 Well… I will write anyway an entire post about Feria. 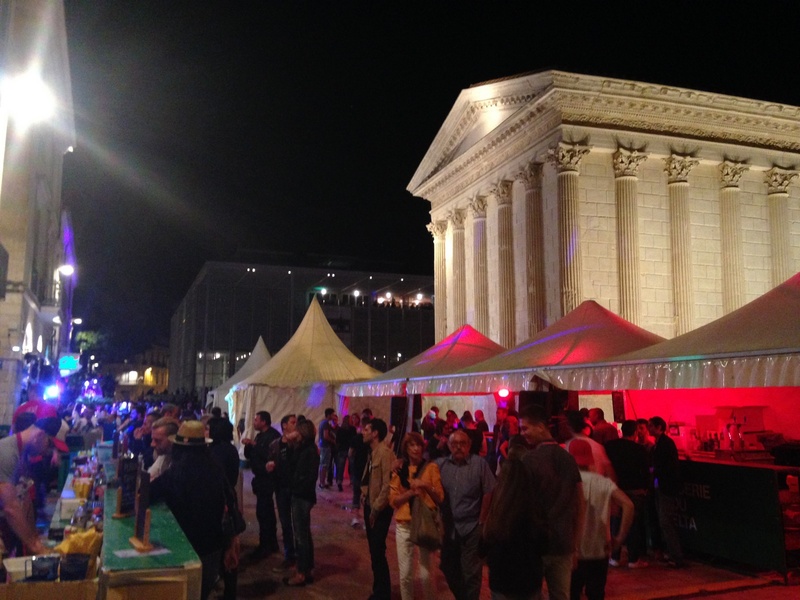 Please also notice that there is Feria in other nearby cities as well as corridas such as in the City of Arles, but the Ferias de Nîmes are definitely and by far the most important ones. 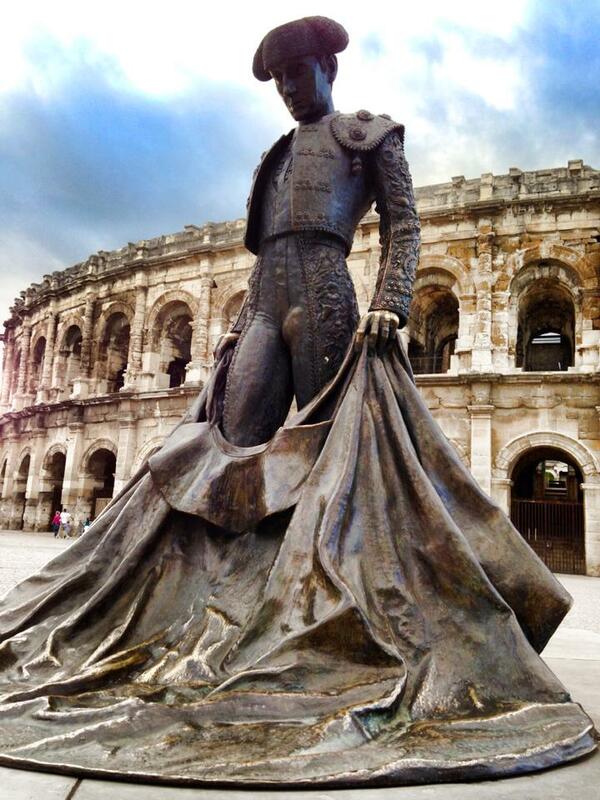 By the way the bronze statue that we can see in front of the Arena on the South Side is the one of the most well-known local torero Nimenos II who died on November 25th, 1991 few month after being hurled into the air by a bull in the Arena of Arles on September 10th, 1989 in Arles. 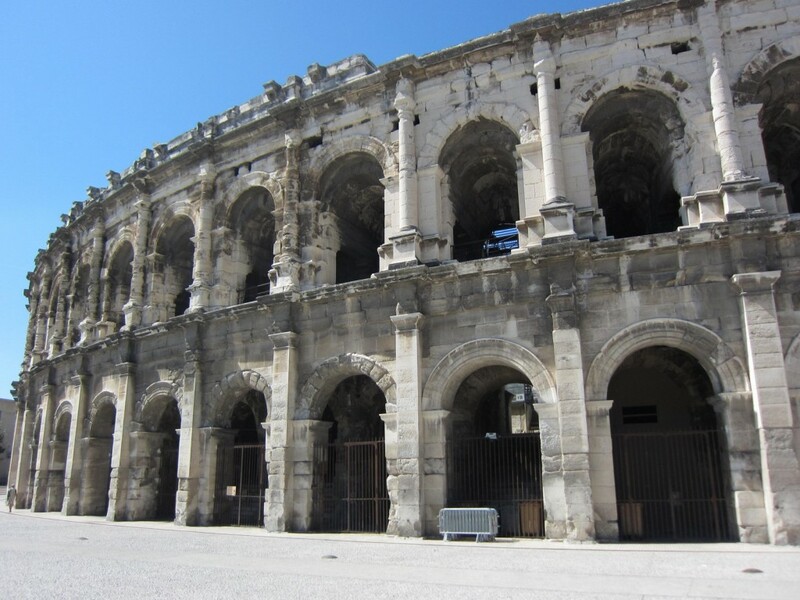 In the ancient Roman times, thanks to the the basics architectural rules set up by The Roman architect Marcus Vitruvius Pollio, the arena of Nimes was capable of holding more than 24,000 spectators, who each of them could get an unobstructed view. The seats were spread in such a sequence in over thirty four rows of terraces which further divided into four separate maenianas or areas. 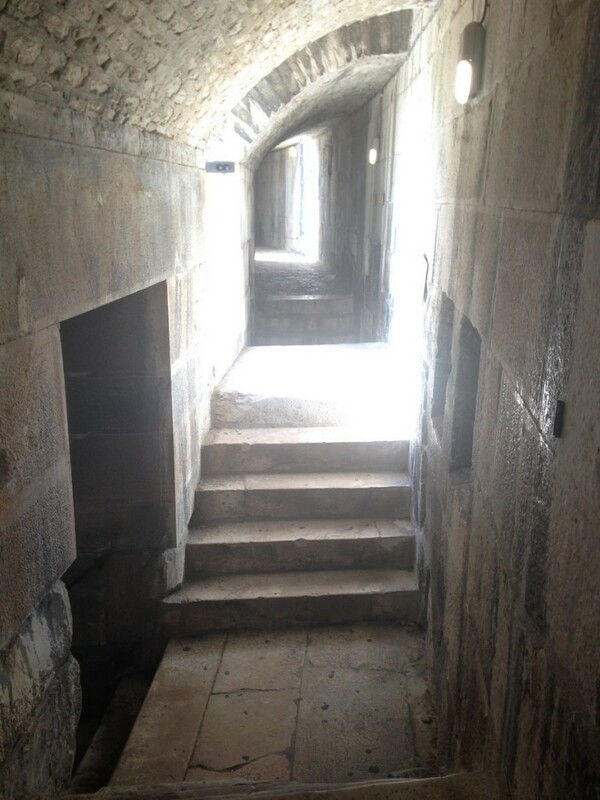 Each of these areas could be accessed through a gallery, and a hundred of passages and stairwells, so when we say this is a masterpiece of ancient architectural mastery, we are only getting started. After centuries of its construction, the rock solid structure (as stated above) still stands tall as an elliptical central space boasting a baffling 133 m long by 101 m wide of area. It still there, nice and clean, right in the middle of the city of Nîmes. The very carefully planned out construction of the arena even accounted for bottle necks as spectators flooded in thousands, and the engineers devised multiple entrances to avoid any tragedies. 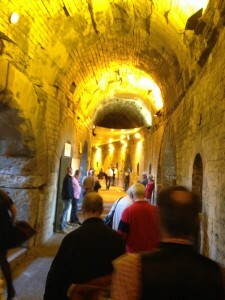 All the services necessary for the shows where there under the arena: stores, cages for lions, crocodiles, gladiators, lifts that lead to trapdoors situated on the floor of the arena etc… The underground part of the arena start at the “vomitoir” level and it can be visited from time to time with a guide. 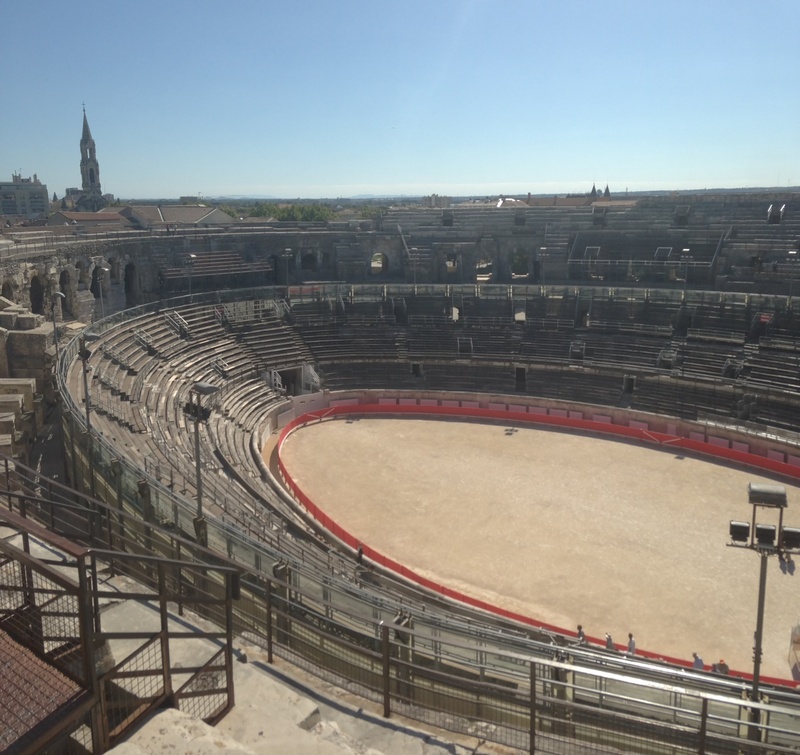 The Arena of Nîmes has been very skillfully designed with the prime purpose of everyone having an unrestricted view, no matter where they were seated, of the whole arena. To make the performances even more sumptuous the engineers designed trap doors and a very complex hoist-lift system. 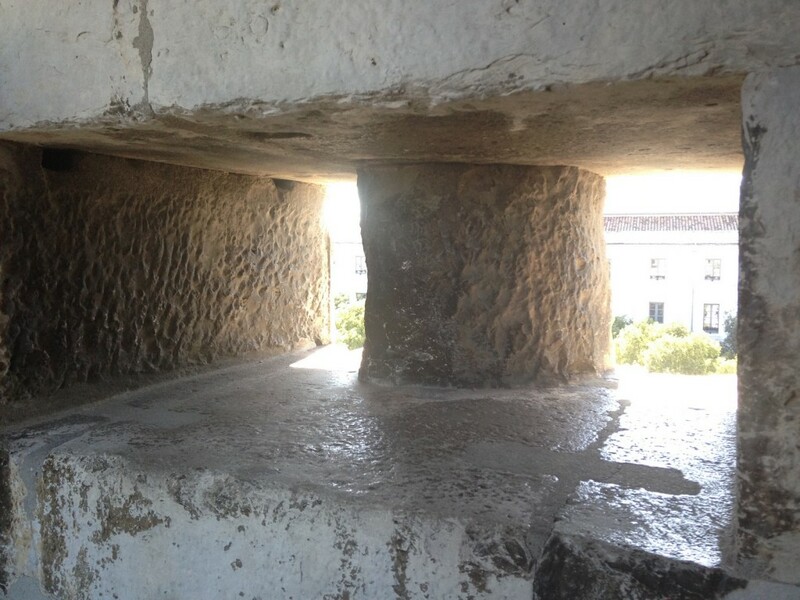 A result of which were the fabled decorative effects that came into the gladiators with animals and gladiators being able to access the arena through these back way hatches, unnoticed. After the fall of the Roman Empire, from the year 400 the Arena became a Visigoth fortress in the sixth century and was even used to protect the population during the medieval time. 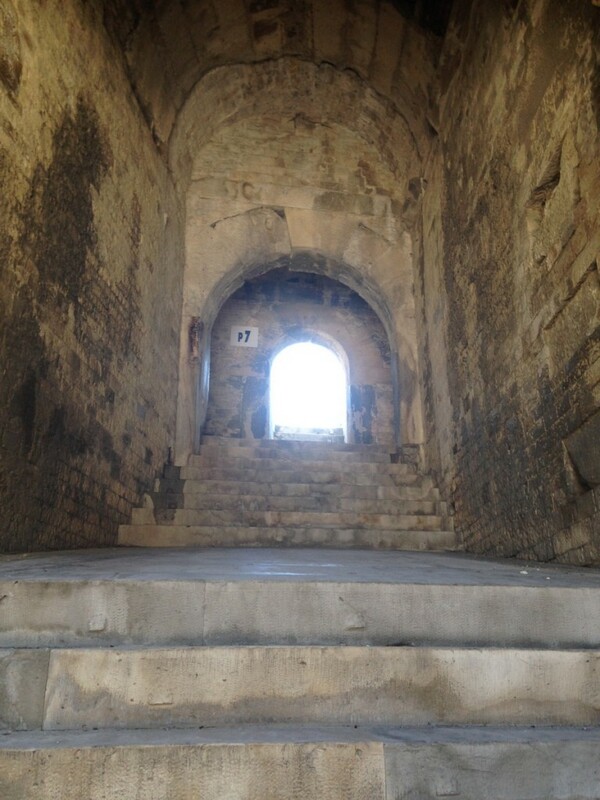 At the 12th century it become a castle for the Viscount of Nîmes. It is the king Francois the 1st at the beginning of the 16th century who after a visit in Nîmes was the 1st person to ask to restore the monument and remove all the constructions that were settled inside. However it is only at the end of the 18th century that the local authorities started to destroy the several houses that were build up within and around the arena. The beautification and the embellishment stoped under the French Revolution and restart in February the 2nd 1809 thanks to the imperial decree. 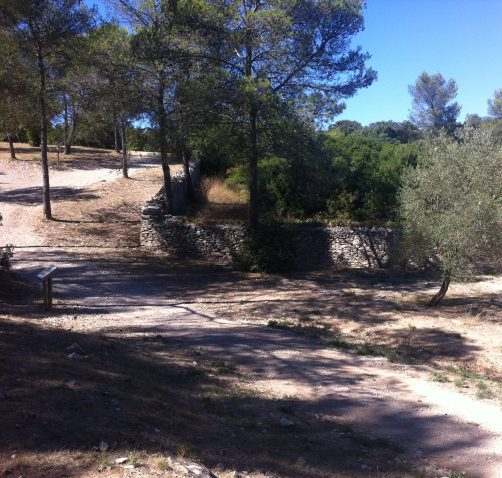 In 1812 there is no more habitation left in the Arena and we will have to wait for the middle of the 19th century to see an important campaign of renovation partly managed by Monsieur Henri Antoine Revoli. The fully restored monument has been a popular tourist spot for decades; the heritage site speaks volumes of how majestic Rome must have been and stands tall as an architectural wonder. 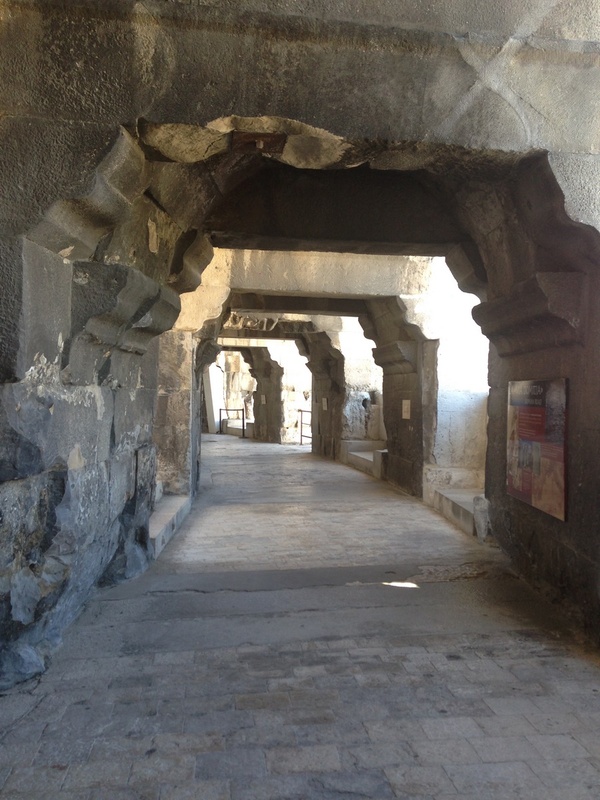 This complex is undoubtedly one of the seven wonders of the ancient world and acts as a doorway to past. 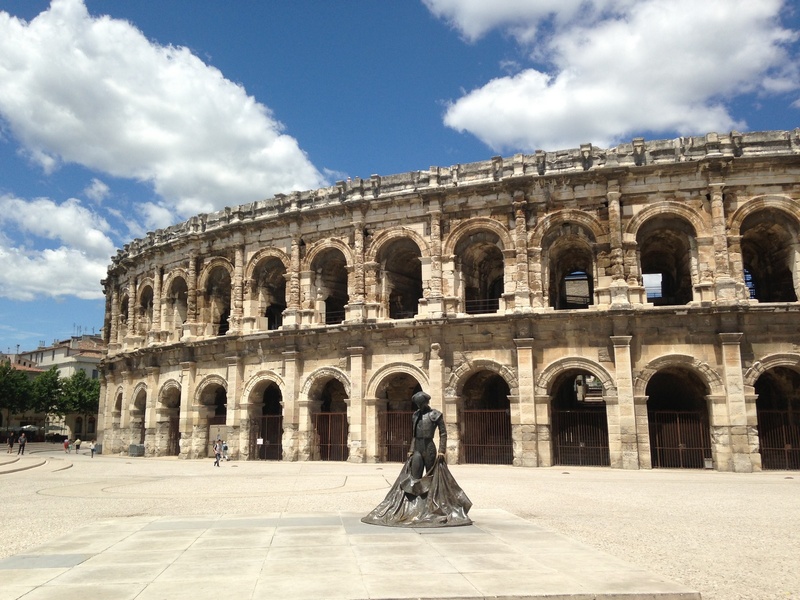 For many spectators and tourists alike the Nîmes Arena comes forward as a popular tourist destination, which not only helps get a taste of Rome but also France with the concerts and various public gatherings in the arena. 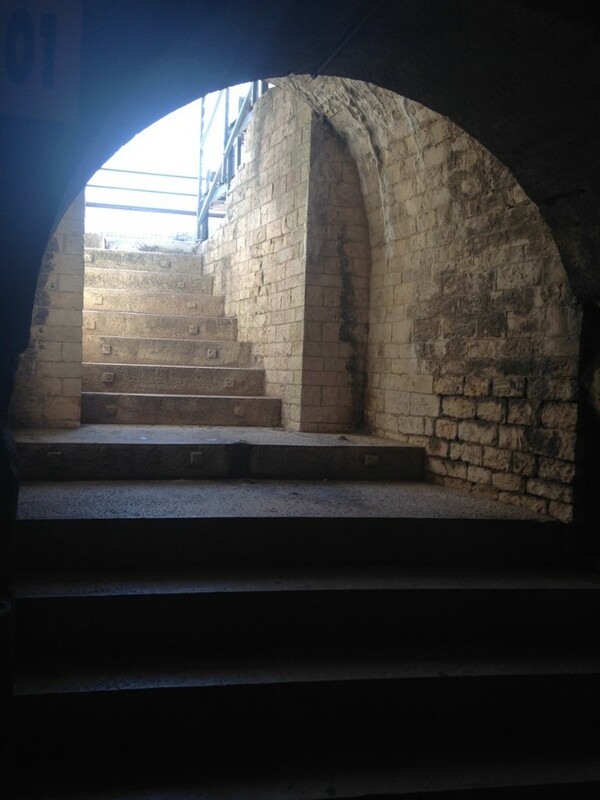 However, the true experience that the arena has to offer is of transporting you into the roman era as you experience the arena as one of the spectators back in the days. 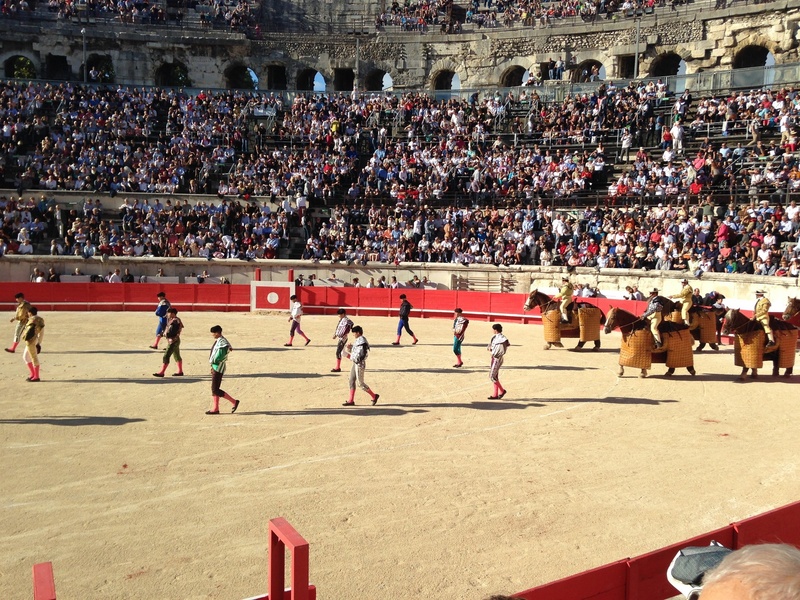 We can also notice that once per year in May, Roman games are organized in the arena with gladiator’s fights (not to death) and Roman Chariot Racing! 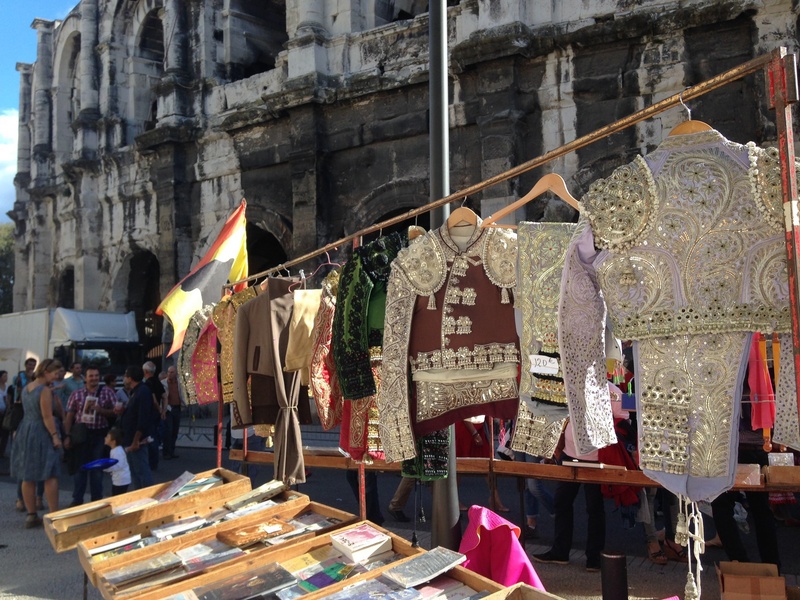 The arena of Nîmes includes some detailed and truly intriguing exhibits. You could easily visit the whole monument with an interactive audio guide (made in 8 languages) that will take you on a ride through time and space. This is a great option if you want to visit by yourself without missing any detail, since this audio guide is dealing with almost everything to know about the Arena from the architecture to the History. The Arena has helped us fantasize the Roman past times, civilization and the might of once world’s most powerful nations. 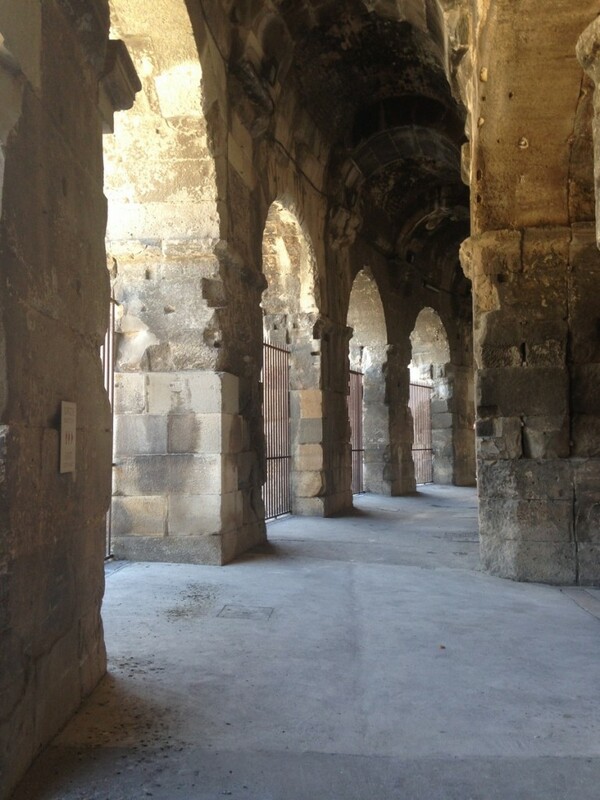 The site has fittings and well preserved reliefs and other decorative elements intact and restored, and since it’s beyond historic and is being used for events the arena has a lot more to offer for all tastes. 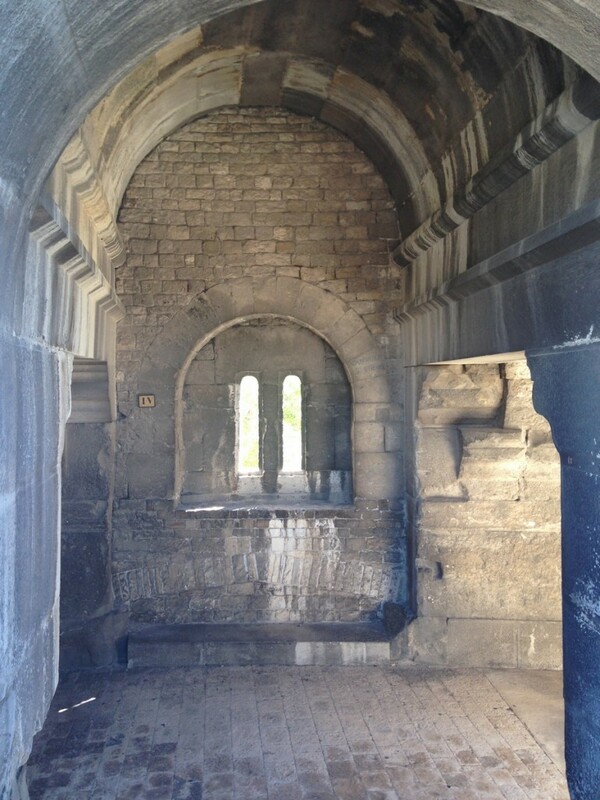 We will notice the recent restoration of the outside walls that started in 2009 and will be complete in 2025.